DALMATIA AUREA Travel Agency - Trogir, Croatia / Fish picnic excursion with our M/Y "Mirakul"
Our organized excursion with the agency owned M/Y "Mirakul" takes you on unforgetable journey to the untouched nature resorts of Adriatic on Island Solta. Taste chrystal clear sea, tuch of sun on the skin, smell of pinewod and Mediterranean trees ,sea salt on the lips. 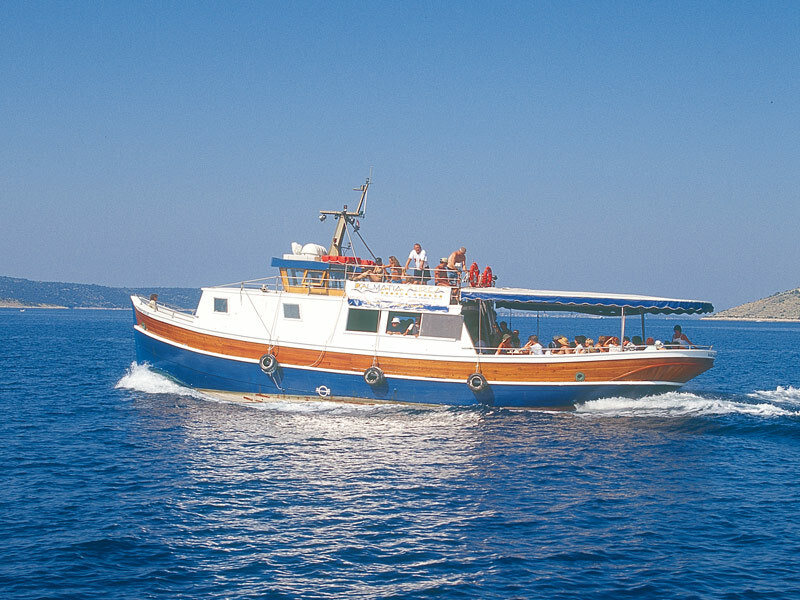 Our crew makes this possible and serve you nice griled fish with fresh salad , Croatian vine, juices & coffee. All of that in a day journey which makes your holiday vacation more relaxed and rememberable. The island of Solta: The island of Solta is one of middle Dalmatian islands. It lies in the centre of the Adriatic Sea, on its eastern coast. 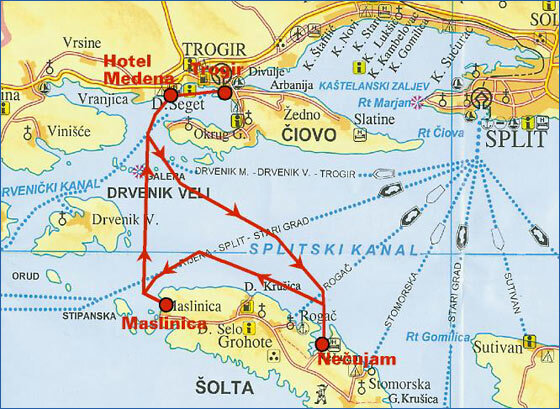 It is only 9 nautical miles (cca 15 km) away from the city of Trogir. Solta’s length is 19 km and its max width is 4.9 km. It lies in the direction of west-northwest-southeast. Its coastal line is 73,1km long. Island of fishermen, farmers, olives and vineyards, today is a chest box which preserves the Mediterranean as it was before. Grey roofs of farmers, fishermen and seamen houses, narrow stone streets and humble homes are the testimony of old times, when the life was hard there. A hard rocky ground forced people to move all the way to far away places of the world, having placed this little island all over the globe. Walking through the old streets of the island sends us centuries away in the past. You can still find figs drying in house yards, old wine-cellars keep a dry taste of the island's wine and traditional singer's songs echo deep in the night. 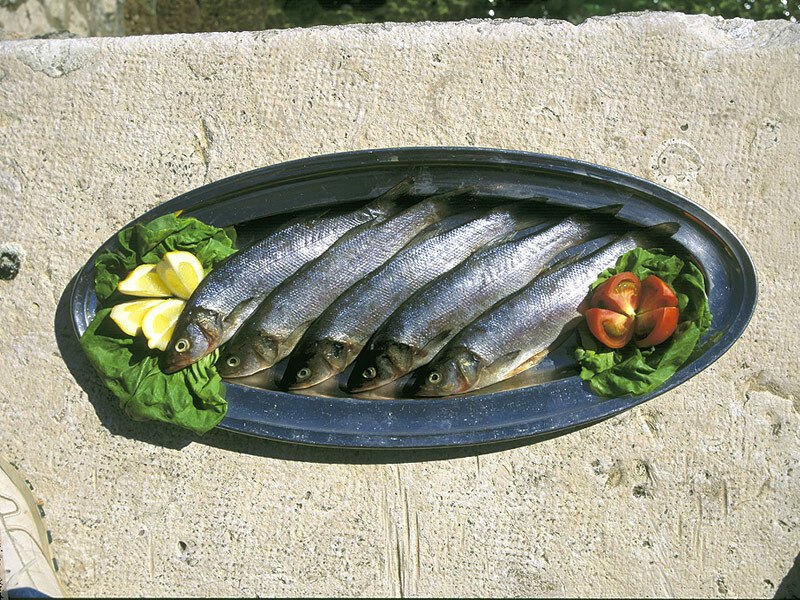 Only a few can resist specialties from the sea, purity of a virgin olive oil and a glass of the strong wine. This charming, Central Dalmatian island welcomes everyone with its open arms offering gladly its green-blue untouched. 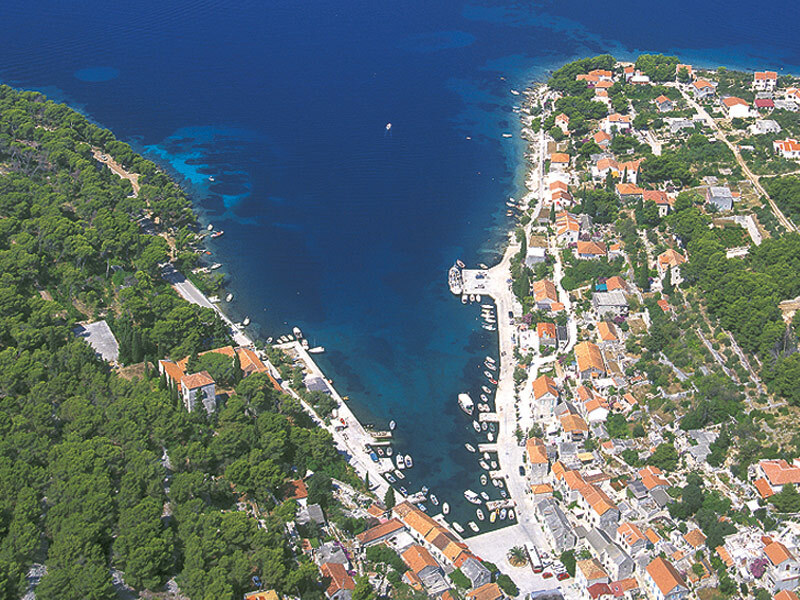 Necujam is the most beautiful bay on the island of Šolta. In fact, it is a range of beautiful bays attractive for their grateness and richness; They are 1,8 km long and 1,2 km large. 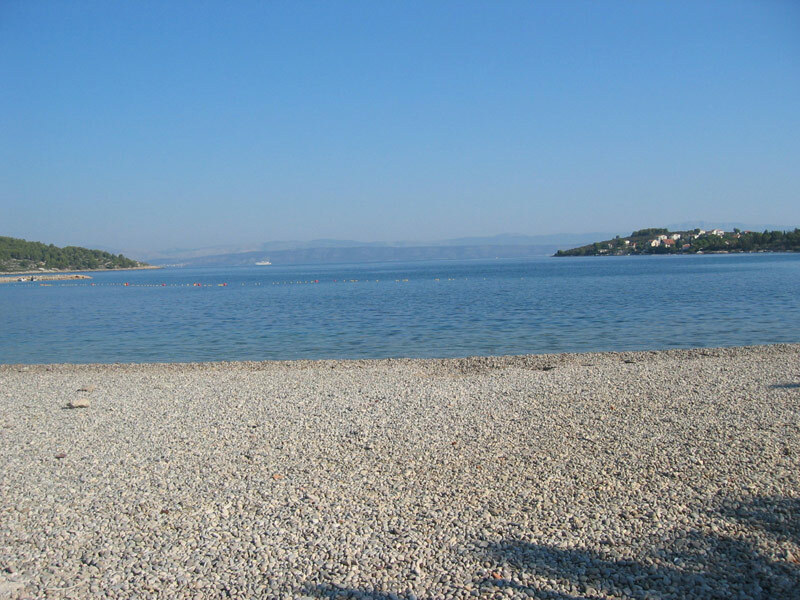 Nečujam is situated in the North of the island, about 9 miles away from Split by the crystal clear Adriatic sea. It is the oldest and at the same time the youngest place on the island. How is that possible? Even Diocletian, the emperor was aware of an exceptional quality of its sea. He had his fish-pond built there. An untouched nature and peace, interrupted only by the cicadas were the inspiration for Marko Marulic's (a great Croatian poet from the 15th century) master-piece "Judita". Petar Hektorovic, another great Croatian poet had been visiting Necujam because he couldn't resist its beauty. But, Nečujam has been changed today. It has become a modern tourist place by building modern summer residences and the tourist village. 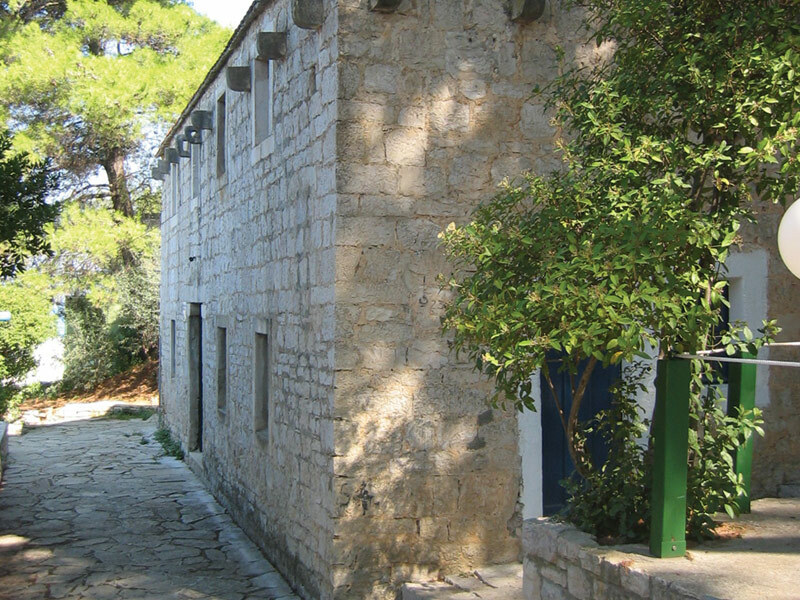 Its history is only revealed by an old Marulic's summer residence, now a museum and a part of the tourist village. 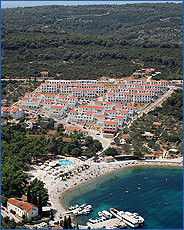 Maslinica is the only Solta’s village situated in the cove of the western part of the island. It has beautiful scenery of picturesque cove and pinewood in the southern side and also of its well-protected cove of Sesul and archipelago of seven islands. On the largest of them in the 5th and 6th century an old Christian church with monastery was built and today there are a lot of remains of it. The natural meaning of olive scenery complete historical-architectonic and environmental values of baroque castle and picturesque local houses. Maslinica was made in 1703 when an aristocratic family Marchi asked from a Venetian “providur” permission to found a new settlement and to build a castle with towers for defense of frequent pirate attacks. Today the castle is turned into an attractive and a very famous restaurant "Conte Alberti". 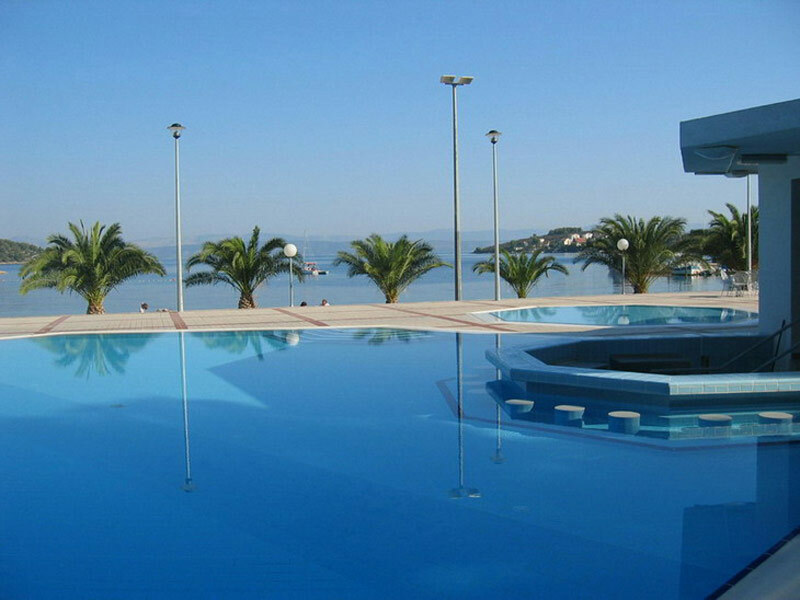 Today Maslinica is very attractive for tourists who want a complete peace during day and night. Ferries and boats don’t come here so Maslinica is connected to Split through Rogac. Member of Croatian Chamber of Economy, Croatian Tourist Board and Croatian Shipowners Association. 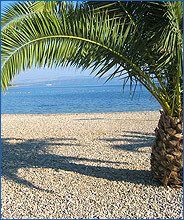 All rights reserved ® da-travel.com 2000 - 2007.